Mongolian participation in World War II brought the dream of a unified Mongolia not only to Choibalsan in the North (see p. 51) but also fuelled the hopes of Inner Mongols in the south. 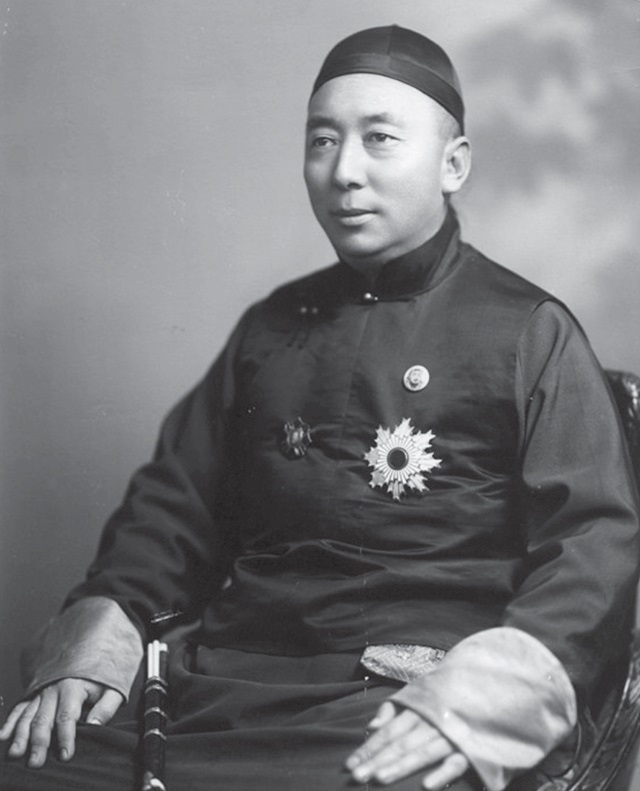 Prince Demchugdongrob, known as De Wang (or simply Prince De), who had led the Inner Mongolian autonomous movement since the 1930s, saw Mongolian participation in the war and the end of the war as a renewed chance for a unified Mongolian state. His vision was shared by other Inner Mongolian leaders from former Manchukuo. 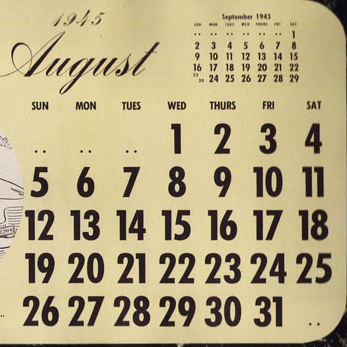 When the Soviet–Mongolian joint motor divisions entered Inner Mongolia on 9 August 1945, the Mongolian Government led by De Wang had long meetings to decide how they should respond to the new situation. The Mongols were divided. Some suggested they should join the Mongolian People’s Republic (MPR) by communicating with the Soviet–Mongolian Army in Inner Mongolia; others insisted that De Wang should go to Peiping and make contact with Chiang Kai-shek. 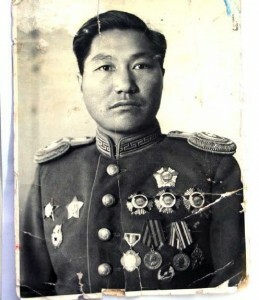 In the end they agreed that Inner Mongolian troops should not resist the incoming Soviet–Mongolian army while De Wang ascertained the attitude of the Mongolian leaders in the north towards a unified Mongolia. On 16 August, he sent a delegation to the Soviet–Mongolian army to sound out their attitude towards Inner Mongolia. If the MPR could unify Inner Mongolia with Outer Mongolia, he wrote, the Inner Mongolian government in Kalgan (Zhangjiakou) and Mongols would follow and De Wang would return home to live as a Mongol in Mongolia. The overture failed. First, the delegation was delayed by Soviet troops because they lacked appropriate identification. Then, the Mongolian officers they eventually met did not respond clearly but instead directed them to their superiors in Ulaanbaatar. Before the delegation returned to Kalgan, Soviet airplanes dropped leaflets denouncing De Wang and his officials as collaborators with the Japanese. On 19 August, De Wang and his inner circle departed for Peiping, believing Stalin would not allow Inner Mongolia to join with the Mongolians in the north. 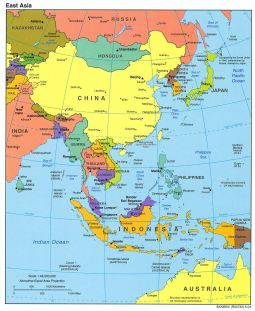 At the same time, the Chinese communists were approaching Kalgan from the south. In Peiping, De Wang tried to communicate with the Chinese Nationalists in Chungking on the one hand and get American support for his cause on the other. Encouraged by Chiang Kai-shek’s recognition of the MPR’s independence subject to the outcome of a national referendum and his mention of Inner Mongolian autonomy on 24 October, De Wang and some of his followers went to Chungking to meet Chiang and ask for high-level autonomy for Inner Mongolia. Chiang, however, responded that the Mongolian problem could not be solved without first solving the Communist problem. Chiang was a diplomat. He did not want to reject De Wang outright, because he was concerned that it might push De Wang towards Mao. He was very much interested in the Mongolian military force and, later in the year, he ordered De Wang’s military commander, Li Shouxin, to go to the Northeast and gather his old followers and recruit new soldiers to be ready to fight against the communists. At the same time, he let De Wang know that he might go forward with the idea of the high-level autonomy of Inner Mongolia in preparation for taking back Outer Mongolia in the future. De Wang realized that the Nationalists would not be reliable in the long term. He thus made every effort to make the Mongolian cause known to the West, especially in America, by talking to American journalists and diplomats including Owen Lattimore. But none of his contacts could help him further. De Wang did not want to join the communists, but ironically fate forced him to do so. In August 1949, he and his followers set up an Inner Mongolian Autonomous government in Dingyuanying, Alashan, the western part of the Inner Mongolian region not yet officially taken by the Chinese communists. But the new government immediately faced financial difficulty feeding its two army divisions. By late September the Alashan region had come under communist control and De Wang with his entourage moved to the MPR border. From there he accepted Choibalsan’s invitation to enter the MPR on 29 December 1949. Choibalsan shared De Wang’s dream of building a unified Mongolia, and the newly exiled prince hoped at the least that Choibalsan would offer some assistance or refugee status for his followers. He was mistaken. Choibalsan never met with him personally and, after being treated as guests, he and his entourage were arrested about two months later. On 18 September 1950, they were sent back to Peking as criminals. His family, who had been invited to Mongolia and treated as honoured guests since 1945, was sent to the Mongolian countryside without any means and his eldest son was executed. 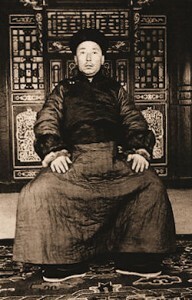 De Wang was kept in a Chinese prison until 1963 and his dream of a Mongolian state including Inner Mongolia had vanished. 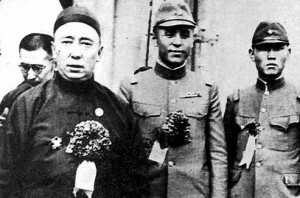 Having worked with the Japanese and other Mongol separatists like Li Shou-hsin (centre) to carve out an autonomous Mongol state, Prince De had difficulties coming to an accomodation with the Nationalist government.